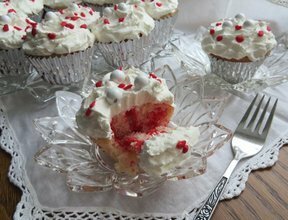 Moist and delicious, these red and white cupcakes are perfect for Valentine's Day or any special occasion. Cherry Chip cake streaked with cherry gelatin makes a colorful display that is sure to catch your valentine's attention. Here you will find great ideas on how to create the perfect Valentine's Day for that special someone. Enjoy the Mardi Gras season with some traditional fun by making a Kink Cake that includes a special surprise.